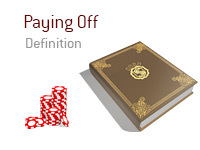 What does the term "paying off" mean as it applies to the game of poker? What does the term "paying off" mean? In poker, "paying somebody off" occurs when a person is fairly certain that they are beaten in the hand, but they call a river bet anyways because there is already too much money in the pot relative to the size of the river bet that they are facing. You are involved in a large hand with one other person. This is a multi-table tournament. You are holding Ah-As. Your opponent called bets on the flop and turn. The board currently reads Ac-6s-7c-Ks-10c. You have seen your opponent chase flushes and straights before, so you assume that he was on some sort of a draw. The river would have hit a number of his different draw possibilities, so you are relatively sure that you are now behind in the hand. There was 4,000 in the pot before the river card was dealt. You check after the 10c hits the river, and your opponent throws out a bet of 1,250. You are almost certain that you are beat, but you "pay him off" as there is simply too much money in the pot already. You are calling 1,250 to win over 5,000 chips, so it's almost impossible to fold. Your opponent flips over Kc-Qc and takes down the pot with his flush. You get into a pre-flop raising war with another player. You are holding pocket Aces. 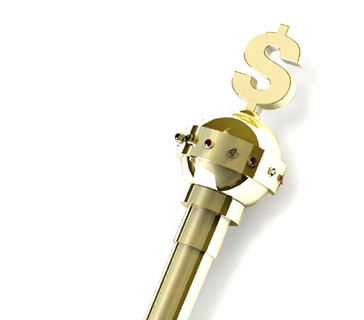 You have been playing very passively so far, so you are telegraphing the fact that you have a very strong holding. The flop comes Ac-8c-7c. Your opponent checks, you bet and he calls. The turn brings the Kc. Your opponent checks, you bet, he raises and you call. The river brings the 8h. You now have a full house and almost certainly the best hand. You put out a bet of around half of the size of the pot, and your opponent reluctantly makes the call. He turns over Qc-Qh and winces as you show your full house. Your opponent was nearly certain that you had pocket Aces but "paid you off" anyways.